Home/Health-Articles/Can CBD Help You Sleep? Question: Does CBD Help You Sleep? Hello. I’m Dr. Bill Rawls. A lot of people have asked the question, can CDB from hemp, a form of cannabis, help with sleep? The answer is yes, it can, but it’s not really a sleep remedy. How CDB works is it affects receptors in the body that oversee neurotransmitters, so it has a nice calming effect. It doesn’t as much put you to sleep as it does set up conditions that make it very easy for you to go to sleep. We know there’ve been plenty of studies looking at CBD and sleep, and we know it doesn’t disrupt normal sleep architecture, so it promotes normal sleep instead of an artificial sleep like a sleeping pill does. That being said, I don’t think it’s a primary herb for sleep. There are other herbs that actually work a little bit better, such as passion flower, motherwort, and bacopa. But if you’re using CBD, you may find that your sleep is a little bit better, especially if anxiety and stress are a problem. 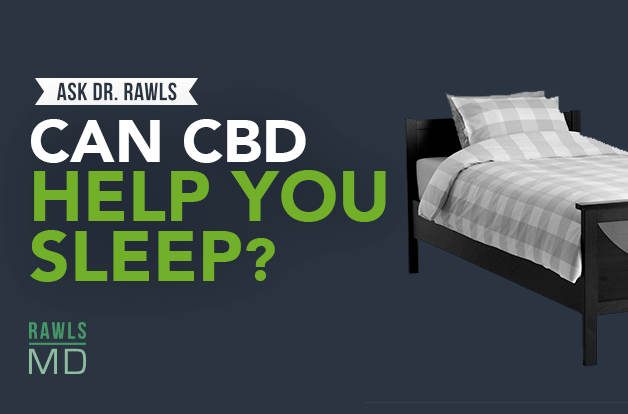 You might find that using CBD regularly, you’re going to get better sleep. It doesn’t work for everybody. Some people, it actually aggravates their sleep. Everybody’s body chemistry is a little bit different. But most people do have improved sleep when they’re using CBD. I recommend using it during the day as you need it, but not necessarily as something that you would take before bedtime. It’s what happens during the day and how it affects the neurotransmitters during the daytime that sets you up for better sleep at night. If you’d like to know more about CBD, please go to my website, RawlsMD.com. I’ve written a really thorough blog on CBD. There’s lots of other information about many other topics, so join us. Sign up for our newsletter. We have lots of great information for you.